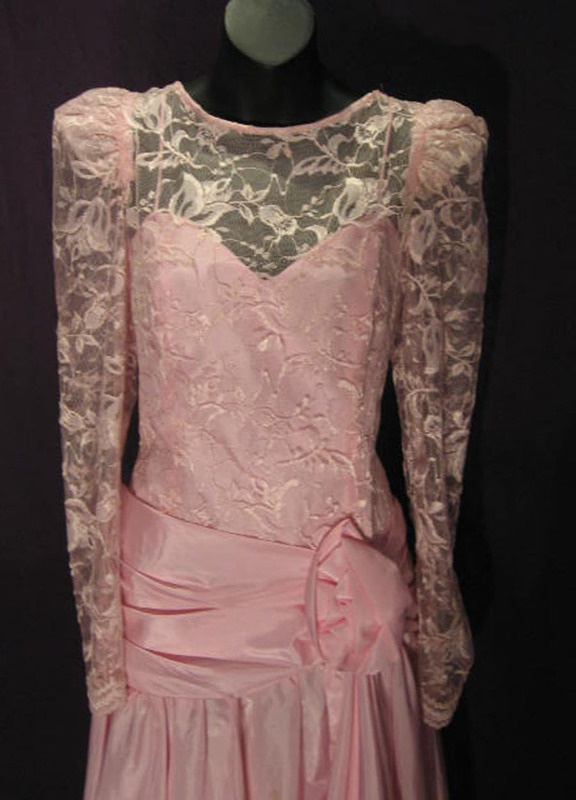 Pink Taffeta full slip court train dress has a attached “V” Neck back lace bodice. Bodice’ has puffed lace long sleeves with a scalloped wrist design and snap closure. 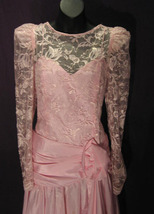 The long waist lace bodice has a large cummerbund with a rose attached. Dress closes with zipper, hook and eye as closure in the back. Perfect for any formal occasion from cocktail parties to homecoming or prom dances. Dress is in near Mint condition. THE DETAILS OF THIS ITEM? Size stated on label / tag: Unknown Designer/Manufacturer: USA Union label only Main Colors: Pink Bust: 38 Inches Waist: 30 Inches Hips: 40 Inches Lined: No Sleeve Length: 26 Inches Length: 46 Inches front/60 Inches train Pocket: None Type of Material: 100% Polyester Taffeta??? Care of Garment: Dry Clean Rated: Near Mint Condition Clothing Ratings Mint: Brand New - with or without tags Near Mint: Like New Condition worn once or twice Excellent: Light wear, " Nothing distracting”. Very Good: Used gently, No noticeable stains or tears (or VERY tiny or FAINT), a gentle touch of wear. Sound structure. Nothing visually detracting. Good: Used, but still has life, may have spotting, wear or fraying. Visual problems but structure sound Fair: Used, so-so condition but usable, heavy spotting, fraying, still useful for the creative. Poor: Heavily used, stained, worn or split, a pattern, project, or a cutter On occasion I might miss something, don’t worry. Just notify me directly, I will always promptly respond to your questions or concerns Customer Service is my #1 Priority. I KNOW you will love our items and the service that comes with it. If you need additional pictures (or better) pictures let us know, items are MUCH better than pictured.